Originally titled “The Joel & Ethan Story,” this piece first appeared in the October 1989 issue of Premiere and appears here with the author’s permission. Joel and Ethan Coen’s new movie, Miller’s Crossing, opens with an oddly poignant shot of a hat blowing through an autumn forest. A little later, Tom, the hero, tells Verna, his mistress, that he dreamed he was walking in the woods when the wind blew off his hat. Later still, we learn that this stretch of woods is called Miller’s Crossing, and it is a place where gangsters take people to kill them. In fact, Tom himself takes someone there to kill. Which makes the hat and the forest the pivotal images in the single most impressive movie of the year so far. Chosen to open the 1990 New York Film Festival, Miller’s Crossing is a brilliant mixture of satire and seriousness, style and substance, a bitter love story embedded in a gangster gothic, a film that is at once an homage to films noirs past and an extraordinarily assured leap into the future. Although their previous film, Raising Arizona, dipped its toes into the warm bath of sentiment, the Coens have always been ironists—cold and distant, puppet masters in the grand tradition of Hitchcock. Not that they’ve given that up for a happy ending and a trip to Disneyland; if anything, Miller’s Crossing is darker than their other films. What they have done is drop their ironic distance. If The Godfather found greatness by taking the then-dismissed gangster genre seriously, Miller’s Crossing is a post-postmodern Godfather that rollicks in the silliness of the genre but still somehow plumbs the depths of emotion. This is a movie teeming with caricatures that keep on revealing real characters underneath. We see a buffoonish gangster, then meet his child; we see a tough guy, then meet his male lover. Even a dead man still has a toupee between him and the bald truth. It’s an unsettling combination of the grotesque and the touching, a tongue-in-cheek tongue kiss. But ask the Coen brothers why the movie is called Miller’s Crossing and you get deadpan responses, Beckett by way of Hammett by way of Rocky and Bullwinkle. There is a striking similarity between the dialogue of the movie and the Coens’ own speech—the terse suggestiveness, the irony, the existential flatness of tone. It’s the sound of cheap detectives making wisecracks into the void. 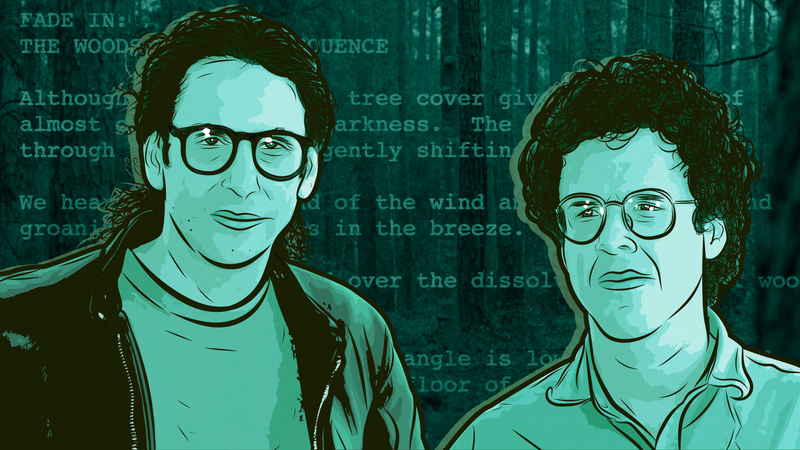 This is the Coen style, onscreen and off, which is why most of the articles written about them have titles like “The Brothers From Another Planet” or “Warped in America.” In person, as onscreen, the Coens never apologize and never explain. It’s true that they’re a bit different. They seem normal—just look at them and you know they hung out in the English or film or philosophy department of some damn college, and they went to lots of movies, and they read lots of novels. Joel slouches in a corner with his scraggly long hair half covering his face, and Ethan looks attentive but slightly abstracted in his wire rims. They wear blue jeans and T-shirts. The Coens are hot commodities in Hollywood, and Miller’s Crossing is apt to make them hotter still. Twentieth Century Fox had to fight off bids from other studios for distribution rights to their next film, Barton Fink. Fox ended up providing almost the entire budget, reportedly $9 million, in exchange for domestic rights alone—and this for a period piece about writer’s block. From the beginning, the Coens have had final cut, a power many far more experienced directors would kill to get. And they have used their power to make not artsy black-and-white “films” but their own twisted versions of classic Hollywood genres, risky movies without viewer-friendly characters and happy endings. The boys left high school early and went to a private Massachusetts school called Simon’s Rock of Bard College. From there, Joel transferred to the New York University film department, and Ethan went to Princeton and studied philosophy. After college, Joel edited horror films and took odd film jobs until Ethan graduated and joined him in New York. They began writing scripts. One was a murder mystery called Suburbicon. Another was The XYZ Murders, cowritten and directed by Sam Raimi and released under the title Crimewave in 1985. Then there was Blood Simple. They are famous for their meticulous planning. They put virtually all the visual and cutting cues in the script and storyboard every shot. They don’t let actors change a single word. “It would be completely inappropriate to say, ‘I got a great idea: Verna’s really English,’” says Harden. The Coens also control their budgets, which inspires audible gratitude from their backers. For example, they almost gave up on the memorable shot from above the ceiling fan in Blood Simple because it was taking too long to set up. “They say they’ll do something, they do it, and often for less,” says Pedas. Until Miller’s Crossing, none of the Coens’ characters were capable of much thought. If they weren’t actually blood simple, they were hayseed dumb. But the hero of Miller’s Crossing is a guy with a million angles. Tom always seems to be one step ahead of everyone else. That’s his job, in fact; he’s the brains to Leo’s crime boss. The Coens up the ante by pushing him into a situation in which his survival depends on how fast he thinks. But the Coens put a twist on the power of positive thinking by making their hero win the world and lose the girl. Is the only thing more foolish than a man chasing his hat a man trying to use the head under the hat? When things get this complicated, you get the itchy feeling you may be watching “art.” It has the ring of truth, even if you can’t figure out what the truth is—or maybe because you can’t. The Coens have taken the leap from the stylish confectionery of Blood Simple and Raising Arizona to what novelist John Gardner called “moral fiction.” Miller’s Crossing ultimately isn’t about film, it’s about humanity. So what’s profoundly true is the way the specific story works out? What the specific characters do? And nothing more than that? Maybe the Coens are just the most un-self-conscious self-conscious artists in history. Their evasive and jokey approach to interviews—much like that enigmatic hat—reveals as much as it conceals. For the Coens’ disdain of abstract thinking goes far beyond the traditional artist’s distrust of ideas. It goes, finally, as deep as style itself—which in many ways is what the Coens are all about. Theirs is a style that’s exuberantly attentive to surfaces, to the look of things, to style itself. Barry Sonnenfeld tells a story about the memorable shot in Blood Simple in which the camera, tracking along a bar and coming to a drunk who has fallen asleep across it, simply bumps up and over the drunk. It is a signature Coen shot, echoed in Raising Arizona when the camera tracks over a car, up a ladder, and in through a window, and in Miller’s Crossing when a camera dollies in on a screaming man’s face. But that shot was cut from the first edit of Blood Simple. “I asked Joel why, and he said, ‘I don’t know. It just seemed too self-conscious to me,’” Sonnenfeld recalls. No wonder, then, that one of the Coen trademarks is the extended wordless sequence, like the 15-minute burial scene in Blood Simple, a moment of pure film, at once a bravura bouquet to the art of movie-making and a chest-beating announcement of the Coen brothers’ considerable powers: Look, Ma, no words! We don’t need ’em; we can make pictures talk! Hell, we can make them sing! With Miller’s Crossing, the Coens have taken the truths of style a step further and found depths in the surface itself.